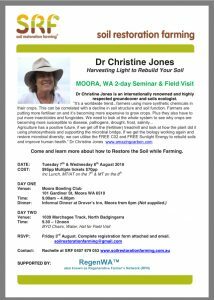 Don’t miss this great opportunity to see Dr Christine Jones in Moora for a 2-day Seminar on Tuesday 7th August, followed by a 1/2 day field visit on Wednesday to the property of David Paish in Badgingarra. 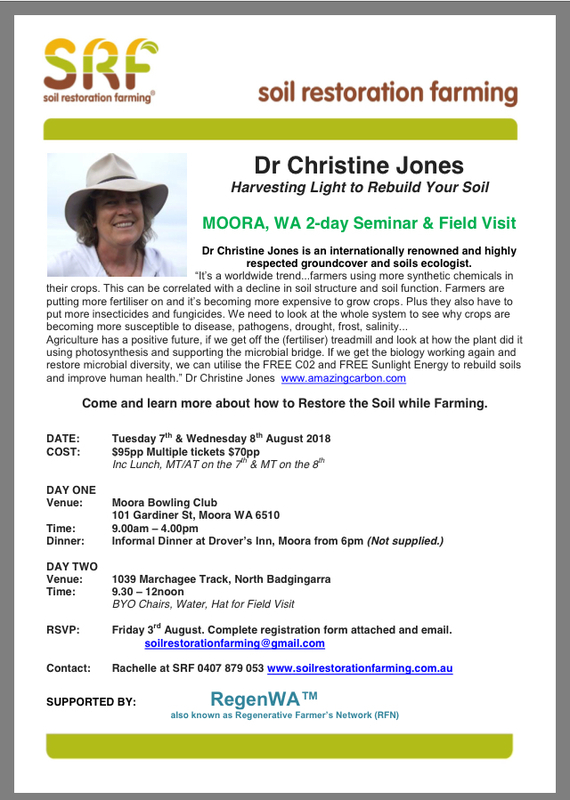 Christine is an internationally renowned and highly respected groundcover and soils ecologist. She has both influenced and worked with leading regenerative farmers and scientists worldwide. Her presentations have helped farmers like Nick Kelly of Newdegate to revolutionise their family farm. Nick will be presenting an update of how his innovative changes to farming practices are bringing resilience to their farm, through building healthy soil and minimising inputs. Flyer and Registration form below. Registration form can be printed, completed and sent to SRF. Scan completed form (eg take a photo) and email soilrestorationfarming@gmail.com. Payment details are on the form. Please call Rachelle on 9-5pm (EST) 0407 879 053 to register by phone or for further clarification.